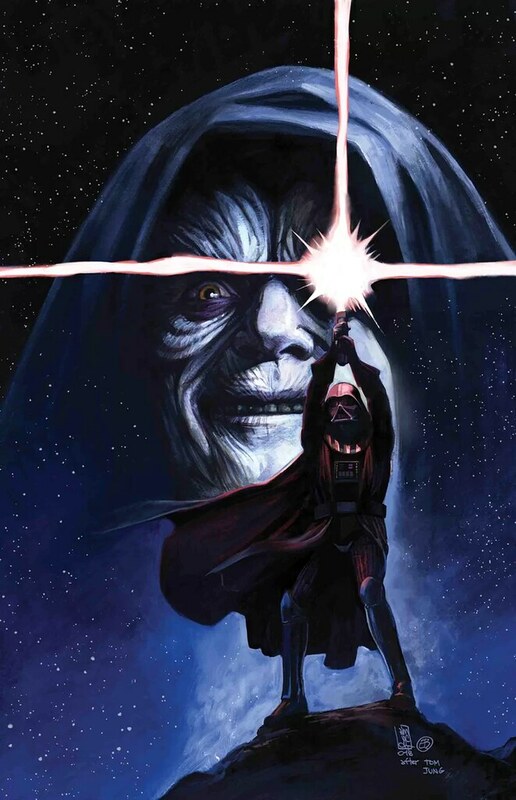 Darth Vader #19 kicks off a new arc, Fortress Vader, and it’s a dark story befitting the Dark Lord of the Sith. In many ways, this is the kind of story fans have always asked for, and throughout the years, we’ve gotten some of. This is Vader, in his prime, hunting Jedi during the the dark times. And in this one, we get a Jedi with some name recognition, and not the Jedi librarian. The issue opens very peacefully with a baby being born to some Zabrak parents. A little girl. However, page two reveals this will not be a sweet tale, but a nightmare. Darth Vader is their first guest to congratulate them on the birth. But he has no interest in being nice. He’s here to deliver death, and take prisoners. His targets – Eeth Koth and his newborn baby. From there, Charles Soule draws out an epic fight between the two, meanwhile the mother and child try to escape with Inquisitors on their tales. There’s some good hooks in the story. Eeth tries to plead for his life with some pretty tempting promises. But whether he’s lying or not, Vader doesn’t go for it. They duel, and Vader ultimately conquers him. The way the fight is drawn out with flashes here and there, and the barbs they trade, it’s very well done. But complementing their showdown is the chase for the baby. At one point it looks like the mother and child might escape, but the Inquisitors get the kid, and the story ends very darkly. In victory, Vader gains another child for the Harvester program, and another dead Jedi on his list. But it appears they’ve run out of known whereabouts for Jedi. The question is, what will they do next aside from waiting around for one to turn up? The artwork in this issue is very solid. Giuseppe does a good job with the characters, the action and the emotions. And there is a lot of emotion to be conveyed in this one with the stakes so high for Eeth Koth. Charles Soule crams in a heart wrenching story, and while this one is a dark tale, it’s a good one. I give it a five out of five metal bikinis.